I love it! I don’t know if I’ll ever wear it, but it’s gorgeous! I’m going to enter this one in the Guild adjudicated show and see how it does. 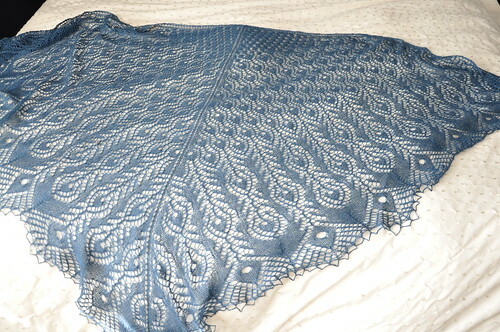 And in case you want details: It’s the Peacock Feathers Shawl, by Fiddlesticks Knitting in their Exquisite yarn. 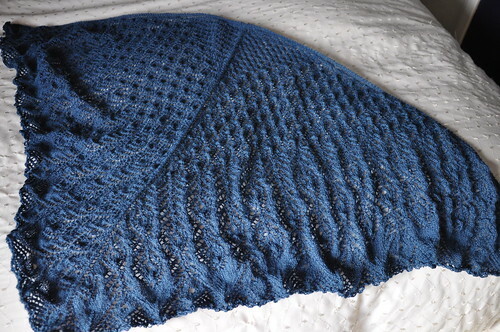 The yarn is lovely and the pattern is extremely well-written. Sure, they’re pretty. But I haven’t even bothered to tuck the ends in. 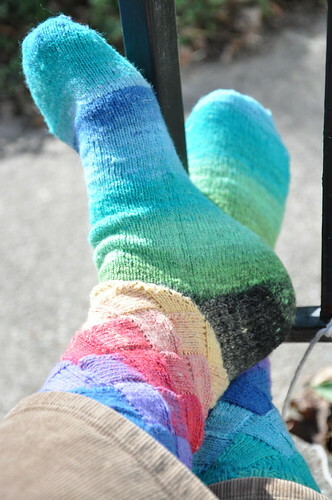 They’ll felt to the rest of the socks soon enough, and the socks will wear out pretty quickly anyway. Noro. Grumble. But they’re pretty. Never again, I tell you! And I mean it this time! I also finished something for EcoMonkey, who is due to arrive this summer. No pictures until it has been given to EcoMonkey’s parents. But I loved, loved, loved the yarn (Tanis Fiber Arts‘ Yellow Label DK). 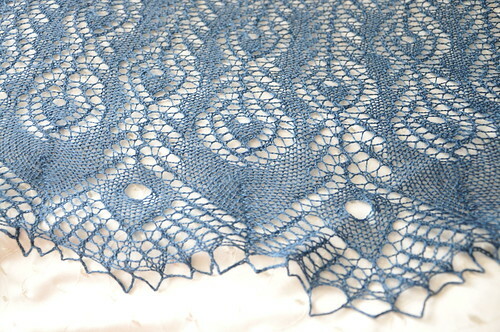 The colours are gorgeous and the yarn has just the right combination of loft and twist. There’s a sweater made out of this stuff in my future. In my ongoing quest to make all the socks in the book Sock Innovation, I’m now on pair number 6 of 15. This time, the Kai-Mei socks. One done, the other half done. And I’m making them in the same colour as the published pattern (I can’t remember what the yarn is), which seems kind of lame to me, for some reason. I started the garden! This year, tomatoes (4 kinds), peppers (3 kinds), radishes (2 kinds), carrots, cucumbers, herbs, and beets. I can’t even keep on top of the laundry these days, let alone take care of a vegetable garden, so I’m cautiously optimistic about this year’s yield. The kids are excited, though.